How to Make a Song a Ringtone on iPhone 6 without Computer/iTunes? Bought a new iPhone 6, or you own one already but having troubles on how to set a song as ringtone on iPhone? This simple how-to guide is specifically written for that purpose. Even better, we are going to show you a few ways on how to set a song as a ringtone on iPhone 6 without having to go through the lengthy and tedious steps of using a computer or iTunes software. Owning an iPhone without having total control over simple yet important features like setting your desired song as a ringtone can be dreadful. Part 1: How to Make a Song a Ringtone on iPhone 6 without Computer? Part 2: How to Make a Song a Ringtone on iPhone 6 without iTunes? 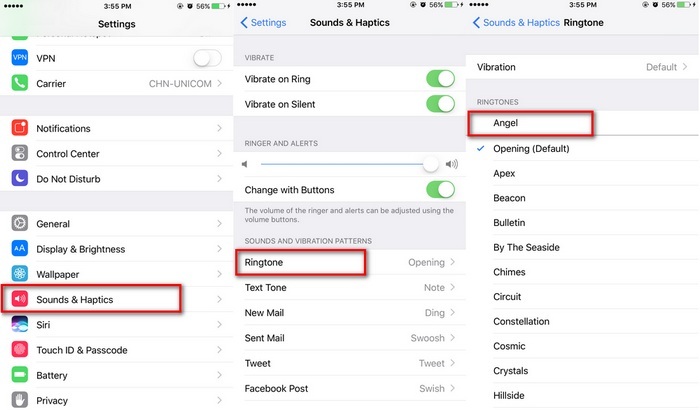 Part 3: How to Change the Default Ringtone on iPhone? In the first part, we'll be making use of one of Apple’s featured apps for iOS and Mac OS X called GarageBand. GarageBand is paid software, but was later made free for iOS for those who purchased new iOS devices after 1st October, 2013. Follow the steps below for how to make a song a ringtone on iPhone 6 without computer using GarageBand. Step 1.Normally, your iPhone 6 will have GarageBand installed. If not, you can download and install GarageBand on your iPhone 6. Launch the GarageBand app on your iPhone. Step 2.Select a song from your iPhone. Tap the + button in the toolbar, and then tap the Loops button in the top right toolbar. Then select the audio source, most likely "Music" to pick from the iPhone Music Library. (You can pick Audio Files and source an audio clip straight from iCloud Drive). Step 3.After song is selected, it will appear on the row. You should use the trimming and split editing features of GarageBand to select the part of the song you want to hear. Up to 30 seconds duration is allowed. Step 4.Save ringtone. Back to "My Songs" picker, find your song in the Recents tray. Long-press on it to reveal contextual menu options. Tap Share. Then tap Ringtone. You can name the ringtone whatever you want. Then tap Export. Step 5.A "Ringtone Export Successful" message box will pop up. Click on "Use sound as" to choose from Standard Ringtone, Standard Text Tone, or Assign to Contact to successfully set your song as ringtone on your iPhone. Custom Ringtone: Customize any song from your computer or iPhone and convert to a ringtone. Transfer Directly: Transfer ringtone directly to your iPhone without the use of iTunes. 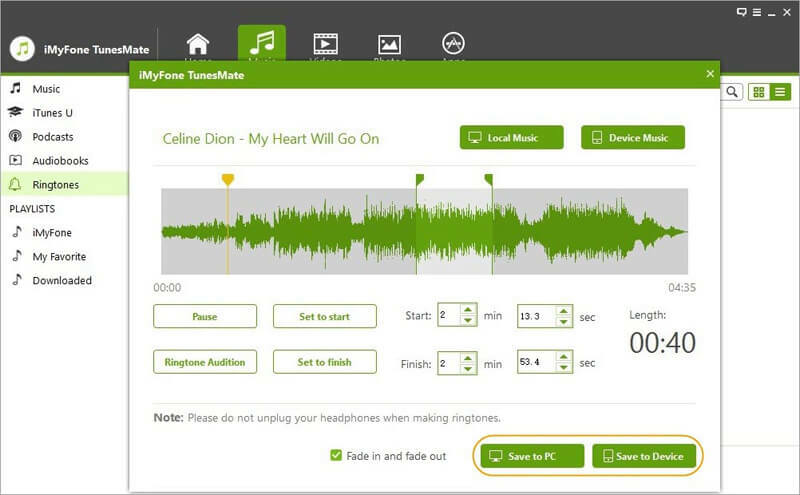 Preview Before Saving: Preview your ringtone before saving and importing. 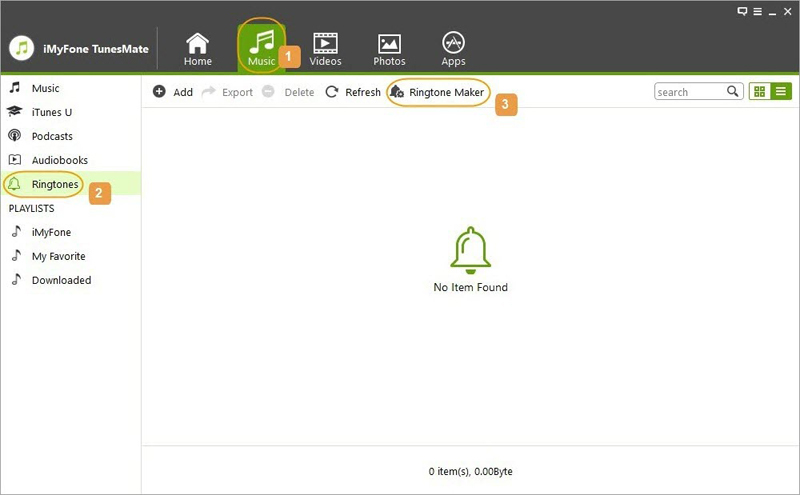 Snart Management: Manage your ringtones freely by importing, exporting, and deleting. Pick Your Favorite Part: Trim your ringtone to your desired length and at your desired section. 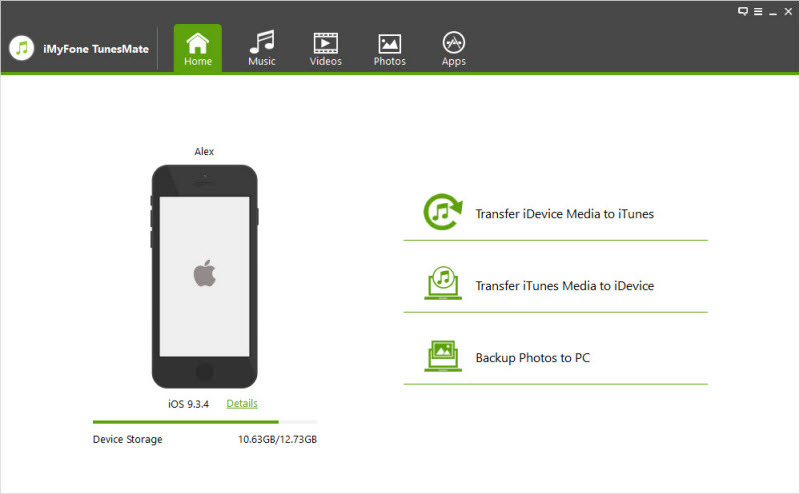 What's More: it also acts as an effective iPhone transfer for video, music, and photo between iPhone and iTunes/PC. TunesMate has been highly recommended by many professional software review webistes, such as Getintopc, Geekreply, tricksworldzz.com, etc. Step 1.Open iMyFone TunesMate software, and connect your iPhone to computer using a USB cable. Step 2.Tap the Music tab, select Ringtone from the left side bar, and choose Ringtone Maker from the sub-menu bar. 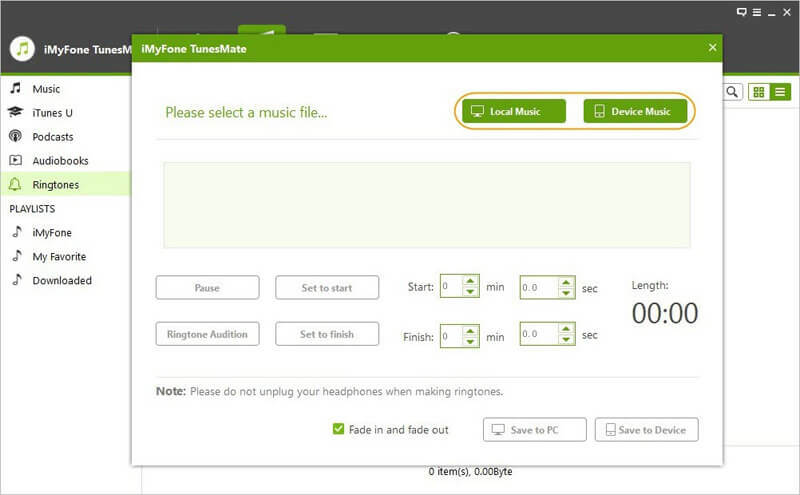 Step 4.TunesMate allows for up to 40 seconds for ringtone duration. You can pick up your desired section by setting "Set as start" and "Set as finish". Before you save it into ringtone, you can preview the section by clicking "Ringtone Audition". Step 5.Click "Save to Device" to save created ringtone on your iPhone. If you want to save ringtone onto your computer, click "Save to PC". There you go. Now you can set what you just made as your iPhone ringtone, so that you can enjoy it every time when you receive a phone call or text message. How to Change the Default Ringtone on iPhone? Step 1. Tap Settings app on your iPhone home screen. Step 2. Then tap Sounds & Haptics (on some older devices, this is just Sounds). Step 3. In the section, tap Ringtone. You'll see the list of all the ringtones on your iPhone. From this list, you can pick up one of the ringtones that came with the iPhone. Step 4. When you tap a ringtone, it will automatically play so you can preview it and decide if it's what you want. When you've found the ringtone you prefer, make sure it has the checkmark next to it and then leave that screen.